In this article we will produce more about linear equations and invertibility matrices. So we will find a new method for solving unknown unknowns. 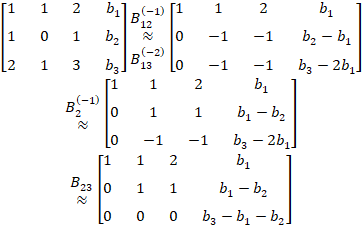 If A is a matrix of n x n which can be reversed, then for each B matrix measuring n x 1, the system equation AX = B has exactly one solution, namely X = A-1B. Because A (A-1B) = B, then X = A-1B is a solution AX = B. To show that this is one solution, we will assume that X0 is any solution, and then show that X0 must be a solution of A-1B.. If X0 is a solution, then AX0 = B. By multiplying the two sections A-1, we get X0 = A-1B. or x1 = 1, x2 = -1, x3 = 2. Let A be a reversible matrix, then the theorem 1 solves this problem completely by specifying that for each B matrix measuring m x 1, the equation AX = B has a unique solution X = A-1B. If A is not a quadratic matrix, or if A is a quadratic matrix but cannot be reversed, then this 1 theorem cannot be applied. In these cases we want to determine what conditions, if there is something that must be met by the B Matrix so that AX = B is consistent. The following example illustrates how Gauss-Jordan elimination can be used to determine such conditions. What conditions must be met by b1, b2, b3, so that the systems of the following equations are consistent? It is clear now from the third row in the matrix that the system has a solution if and only if b1, b2, and b3 meet the conditions. Where b1 and b2 are any. 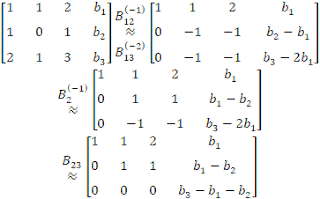 0 Response to "Application of Inverse Matrices in Linear Equation Systems"